George got injured, was on the verge of getting killed. Luckily he managed to pull his gun before the assailant got to it and saved himself with a clean shot. This is the clear and obvious truth with 99.9% certainty. Common sense indicates that a sober neighborhood watch activist would not first alert police before before hunting down and killing an innocent victim. Witnesses and forensic evidence clearly supported George Zimmerman‘s version. Thankfully, he was cleared by unanimous vote of the jury. As the verdict drew near, police and city leaders in the Orlando suburb of Sanford and other parts of Florida said they were taking precautions against the possibility of mass protests or unrest. George’s plight is far from over. He is likely to be injured or killed by a vigilante. He will have to live in hiding. Zimmerman, the victim of a vicious attack, already was unjustly fired from college. Government, the press invented elaborate highly unlikely conspiracy theories that just don’t make sense. The press consistently showed photos of a 12 year old child instead of recent photos of a tall, dope using young man with serious school discipline problems, who shows off gang signs and gold front teeth. As a good man he is, George Zimmerman collaborated with police, right after the self defense killing. He waived all rights to remain silent, or to get a lawyer. He responded everything, explained all that happened. Experienced police detectives know how to catch a lying criminal, but Zimmerman never contradicted himself. His injuries, his wet grassy back, all evidence supported what he said. He was in police custody and was thoroughly investigated and found not guilty. Then the s.o called civil rights movement started to pursue the case. Invented lies and stories about black victimization. Zimmerman had to go into hiding, due to death threats and a racist illegal criminal bounty by the New Black Panthers. Whites were beaten into coma by Blacks telling them "This is revenge for Trayvon Martin." Zimmermann was the victim of a vicious attack, suffered the stress of having to kill a man to save his live. He got arrested due to mob pressure and politically correct government. Financially ruined, his life derailed, forever in danger of being accosted by black vigilantes like the New Black Panthers. 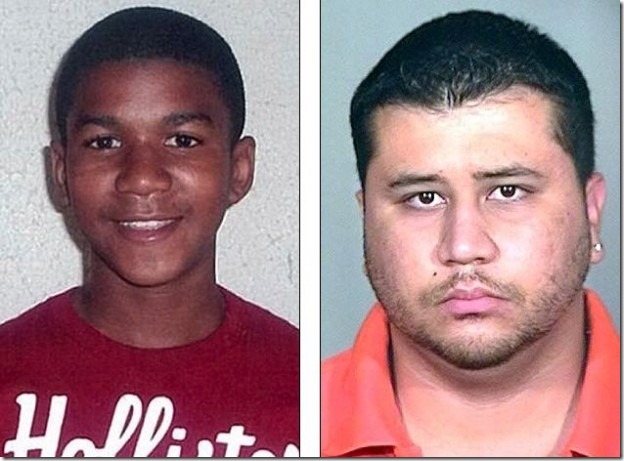 Did Trayvon Martin stay in wait, or run in circles? Had out of shape Zimmermann been the aggressive hunter, chased down athletic football player Trayvon Martin, why did the altercation happen near Zimmerman’s car, at a place they would have passed over 100 seconds earlier? Did they run in circles? Why did Trayvon carefully avoid his nearby destination, the father’s girlfriend’s home, and instead showed up where Zimmerman had been long ago? Even the court proceedings did not clear this up. Mr O’Mara also challenged the jury to think about what Martin was doing for four minutes – after a friend on the phone told him to start running, but before he came face to face with Mr Zimmerman. The defence lawyer fell silent for four minutes, and said the teenager had spent that amount of time planning his attack instead of returning home. Prosecution, and the entire press, spew unlikely or impossible facts, and the defense was, well, too defensive. Was Trayvon Martin a thug? Martin was killed during one of his many 10 day school suspension. A young man who has been found with burglary tools and (likely) stolen jewelry. Elaborate unlikely stories had to be woven to try to explain away the obvious. George Zimmerman ought to be acquitted for proven innocence. This is not going to happen, because the trial focused on testimony of biased people’s opinions, not on facts, time lines, expert witnesses. This is because all the facts clearly support George Zimmerman’s version of the events. George Zimmerman’s honesty and collaboration convinced the police department, and thus he was set free after a short arrest on the day he was (likely) criminally assaulted by Trayvon Martin. Zimmermann got death threats, the New Black Panthers mounted a man hunt. Political pressure from the president down forced a baseless unfounded trial. All evidence supports George’s version, but the trial emphasized moot issues like Martin’s mothers opinion about a voice so garbled that experts said it could not be identified. (CNN) — Florida authorities have a message as the verdict in the George Zimmerman trial looms: raise your voice, not your hands. Anticipating that the outcome of the very public, and racially-tinged, case is likely to disappoint one swath of the population or another, law enforcement agencies have set up a response plan. Part of it is a public service announcement that the Broward County Sheriff’s Office released this week. The press shamefully hides Black Mob Violence (40) from our sight, by not mentioning the race of the perpetrators. Florida will burn, after the inevitable acquittal of George Zimmerman. Zimmerman was only arrested and tried, because a lynch mob of race activists wielded their political influence and even President Obama unduly interfered in police and legal matters. The New Black Panthers might renew their lawless bounty for George Zimmerman. Blacks feel entitled to riot when the feel slighted, like in the Rodney King case. Even London and Paris already had their share of multi-day violent Black riots. Nobody fears a race riot upon Zimmermann’s unjustified conviction, as no race rioted at OJ Simpson’s acquittal 7 8. The only "proof" is all family swear that they recognize that the screams for help were Martin’s voice. What other answer would one expect? Witnesses that were primed and trained as to what the most favorable answers are. And, of course, they WANT to believe that Trayvon was not an aggressive thug. Amazingly, Zimmermann himself once had said that these screams don’t sound like his own voice, Zimmermann himself does not recognize his voice. This is George Zimmermann‘s disarming honesty that convinced police of his innocence. Police correctly had concluded that Zimmerman had acted in self defense and thus had set him free. Unlike the prosecution witnesses, Zimmermann never was caught changing his testimony. Proponents of political correctness distort the truth. We must not defend racial profiling nor mention a long list of black criminality which is a multiple of white violent criminality. IN a similar case, witnesses confirmed that Black youth DeAndre Felton was killed in clear self defense. More proof of George Zimmermann’s self defense and innocence. A book review. George Zimmerman declines ‘stand your ground’ hearing. "We decided to focus on the idea that George wants to have a jury of his peers decide his case," O’Mara told reporters, according to the Associated Press. "And it’s going to be, I think, a more accepted result for everyone who has to accept the result — that he gets an acquittal at trial, more so than an immunity hearing given by a judge." No matter that most "proof" of his guilt proved to be lies. No matter that Zimmermann’s statements have never been disproven. He has never been caught lying about facts of the case. Except, maybe about the value of donations received. No matter that the state has to prove guilt, and not Zimmermann has to prove innocence. George Zimmermann killed Trayvon Martin, after getting his nose broken, the back of his head seriously banged up. In violation of the iron legal maxim "Don’t talk to Cops" he totally cooperated with police, proving that he was acting in self defense. Not one lie, no contradiction was found in his testimony. An outcry of Black fanatism, including president Obama’s infamous meddling in a police case: "If I had a son he would look like Trayvon", caused the case to be re-opened. George Zimmermann was evicted from his college, is in hiding from unpunished New Black Panthers mob violence, He is totally broke from legal expenses. The reason for Florida’s "stand your ground" laws was exactly to spare good men – who act in self defense – the ruinous expense to hire a lawyer. Interestingly, Michael Knox desperately tries to look unbiased. Because the facts are so overwhelmingly in George’s favor. So he finds every little straw that casts light doubt upon George. If George stopped a while to look around, that is enough to explain why he was not back to his car. It is harder to explain why Martin had backed up and returned, instead of just simply going home. Martin was in fact leaning over Zimmerman when the fatal shot was fired, just as Zimmerman has maintained. To reach that last conclusion, Knox examined both a Florida Department of Law Enforcement report on the gunshot’s impact to the hooded sweatshirt Martin was wearing and the autopsy report describing the gunshot wound to the body. The medical examiner determined the gunshot was fired from "intermediate range," but the hoodie showed a "contact" shot, indicating the muzzle of Zimmerman’s gun was touching or extremely close to the fabric when the shot was fired. Knox explained that the loose fitting sweatshirt was farther away from the body because of gravity, which pulled it down as Martin was situated above Zimmerman. That is consistent with Zimmerman’s claim that he was on his back struggling with Martin when he reached for the gun, pointed it upward and fired, Knox said. "We look at the physical evidence and then we say, ‘What does it tell us?’" said Knox, who before his 2010 retirement testified often for the same state attorney’s office that was specially appointed by the governor to prosecute Zimmerman. Knox also says that Zimmermann could have gotten back to his car before the struggle, and Trayvon Martin could have easily gotten home. Of course, neither of the two would be obliged to do so. And Zimmermann had more reasons to stand, linger, wait and look. Trayvon Martin would have more reason to walk a quarter of a mile to get home and out of the rain. More than 2:30 passes between the time Zimmerman hung up with Sanford police (7:13:39) and when a neighbor who heard the commotion connected with a 911 operator (7:16:11). The struggles continues on that call for 45 seconds, until the fatal gunshot is heard at 7:16:56. The evidence against George Zimmermann? Author Human-Stupidy (Admin)Posted on March 23, 2013 Categories Political correctness, Race & IntelligenceTags Human Rights, Michael Knox, Trayvon Martin, black culture, book review, forensics, george zimmermann, history of violence, hoodie, murder trial, new black panther, political correctness, race, race iq, racial differences, racial discrimination, racial profiling, school suspension, stand your ground, unarmed teenager6 Comments on More proof of George Zimmermann’s self defense and innocence. A book review. DeAndre Felton was killed by a white man in clear self defense. No arrest was made. All people present, including DeAndre’s friends confirmed that he had attacked his killer with the intent to create trouble. In spite of such clear evidence, we can see the typical black posturing about the "poor kid" that was killed, without mentioning the child’s criminal intent and attitude. The evidence favoring George Zimmermann is not quite as strong, though his story proved consistent and non-contradictory. male involved in the incident ran away in the opposite direction. "The plan was I was going to go to his house and get picked up there to meet his parents," she told Eyewitness News. Standish said her cousins were with Felton and Jones when they were stabbed. Sounds very much like George Zimmermann. The killer was very cooperative, says police. Police was convinced that it was self defense. Witnesses consistently testify the "youth" were looking for trouble and attacked. And no, black activist don’t bemoan the criminal attitude of the black youth. Rather the usual blabbering that the poor little child is innocent, even though his own friends implicated him as a drugged violent aggressor. Blacks are always victims. Even if everyone can testify that they were the attacker. No sense of justice. Fellow Blacks get defended unconditionally, no matter how heinously criminal they are. Very rare the attitude of reverend Manning, the rare Black who blames Blacks for their own misfortune they bring about themselves. George Zimmermann cooperated totally with police and clearly convinced them that he was attacked and injured by Trayvon Martin and had to kill him in self defense.. Due to black pressure, including US president Obama, who said, if he had a son, he would look like Trayvon Martin, — who seems to have a long history of schools suspension for drug use, graffiti, and more. We wish Obama’s sons had better character, and the chief executive would not interfere in legal court cases..We also wish Barrack H. Obama were concerned with the violent New Black Panther Party and various black hate criminals that have severely beaten whites in revenge for Trayvon Martin. "Because this case has created so much anger and tension and dissension in our country, I don’t think that this judge, at a hearing is going to dismiss the case. […] For a judge to throw the case out before it gets to a jury of his peers would just be the unthinkable, it would cause so much national anger"
Say it! Blacks would riot, loot, burn down large parts of the cities, ironically the parts where they live, like in the Rodney King case. who just bought ice tea and skittles. 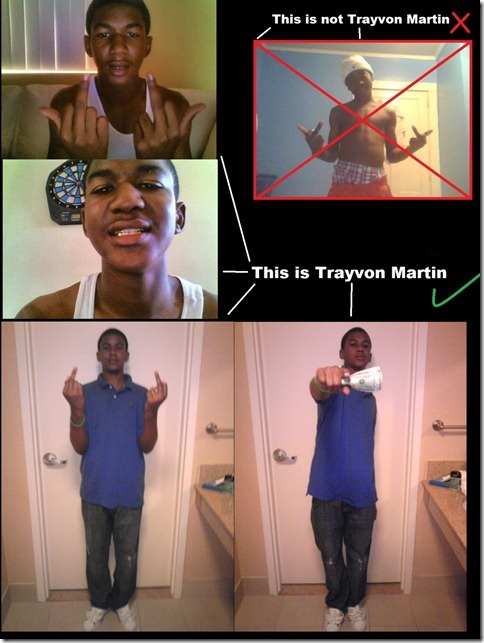 Trayvon Martin would still be alive. and just wanted to go home to watch a game and have his skittles and ice tea. Stand your ground laws must be repealed, because they let guilty people like Zimmermann get away with murder. 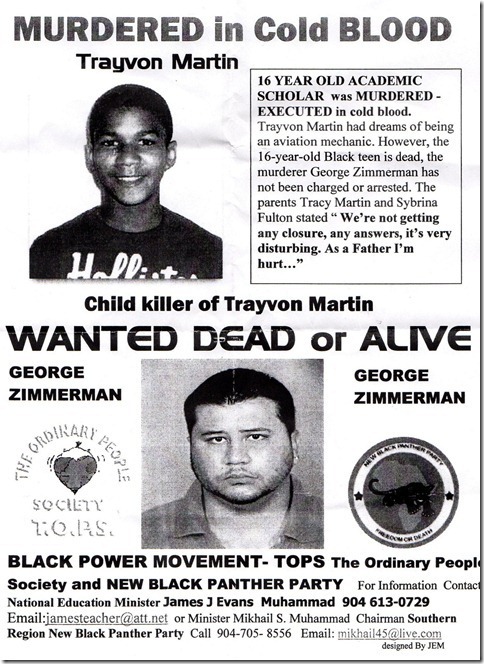 The new black panther party has put up a bounty for Zimmermann, dead or alive. We do have a serious problem. While Zimmermann, together with the Sanford Police Department, is being judged and convicted by the press and the court of public opinion, that police department is not opening the files with all the reasoning why they did not arrest Zimmermann. This may be correct legal procedure, but it allows all rumors to be rampant and unchecked. All evidence should have been put out in the open, immediately.